Becoming a gray man requires a great deal of self discipline so you can determine how others see you. You do not want to be perceived as weak or strong, well equipped or unequipped- you simply do not want to be perceived at all. Swapping the tactical bug out bag for a non descript bag is a step in the right direction, but does not complete the concept. Being aware of how you look, how you move, and how you act are all equally important. At some points in everyday life, emergencies, and SHTF situations you will not want to be noticed, and especially not noticed as a prepper. Balancing this idea of not being noticed with regular interaction is difficult to achieve, but can allow you to be a chameleon when you need to. This skill could be used to move to and from your bug out area or safe house. If supply runs are needed when SHTF, they are best accomplished as a gray man. 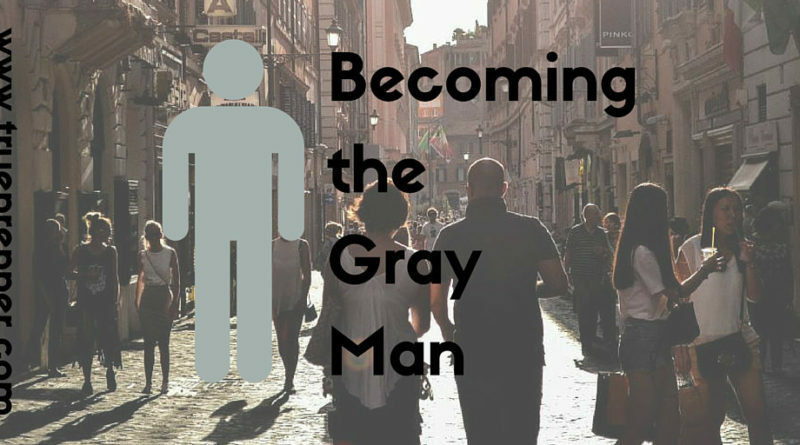 While the term is “Gray Man”, this practice can obviously apply to both men and women. Like the Bug Out Bag, anything camouflage is out. Camouflage, no matter how useful, has a distinct association with the military or a hunter- both of which ID you as having access to guns. Providing this information to every person that looks your way is not advised. Choose earth tones for your clothes, but not a monochromatic look. Do not wear clothing contrarian to the style in the area. Knowing what is too much in the area is key to tweaking your look to fit in and not be noticed. Weather and culture both play major roles in what you should be wearing in a situation where you are attempting to go unnoticed. A ball cap and sunglasses are usually sure things in outdoor areas, weather permitting. These are great because it is best to cover as much of your face as possible. People unknowingly make associations and observations when you look at another person’s face- it is programmed into our biology. Precipitation and cold weather allows you to wear a hood- which is great for going unnoticed. Be wary of tactical and combat boots- hiking boots or shoes may be a better bet. Simple wardrobe updates can have the largest impact. Dress to not be noticed. Your gait and the routes you take say a lot about you. Try walking similar in style to others if possible. Do not go too fast or too slow and stick near crowds and clusters of people if you can. Avoid walking against the flow of foot traffic as that drastically increases your exposure. Most times it would be better following a group on a longer path. Alexandra Paul, a famous actress from Baywatch, said “The cars we drive say a lot about us.” She probably did not have preppers in mind, but she is correct in that our vehicles do reflect upon us whether we like it or not. 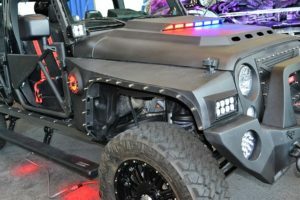 A “Zombie Response Vehicle” with a 4×4 emblem, lift, and overhead rack does not fit the Gray Man ideal vehicle description. If you removed the 4×4 emblem and other stickers with bug and tar remover, returned the chassis to stock, and stored extra gear inside you are getting a step better. If you tint the windows and have a blanket or privacy screen over any items in cargo areas, you are driving a Gray Man vehicle while maintaining almost all functionality. Acting the part of an invisible person can be tough at times. Even if you appear as common as they come, you could be unlucky enough to arrive at the wrong place at the wrong time. Your interactions are important in these periods. If someone asks you “Are you heading to a safe house, do you have someplace safe to stay?” you can easily respond with “I am looking for [my brother. ]” Deflecting questions without stopping or compromising your security is ideal. Ignoring people is not the best plan, since many people become agitated and could pursue you. Creating an alternate explanation ahead of time on whey you are out and about can help in stressful situations. Having the ability to disappear into a crowd is a great skill for those looking to attain self-sustainability. People cannot target what they cannot identify, so ‘laying low’ in public view can help you avoid confrontation. Whether you are dealing with SHTF or an everyday situation, hopefully these tips will help you stay safe and secure. I’d like to cite your work in this article. Could you send me your name so you can get proper credit? Simply SG @ TruePrepper will do. We value our anonymity and OPSEC more than our ‘fame.’ Let us know what you come up with, as I’d love to take a look! This will be difficult i think. My clothes may be unassuming, but I look like I came off safari in the outback; no Kakis though. My clothes, hat and boots look a bit worn and beat up, but it may still be a problem.